Here’s a glowing example of the type of question that really is, just a trick question with no boiler plate answer. If you were to line up squad cars bumper to bumper, how many squads do you think it would take to go from one end of our county to the other? Why on EARTH would anyone ask such a ridiculous question? Have you ever heard the saying, anything can be justified if you try hard enough? I once asked a colleague why he included this odd question on his oral board list of interview questions. His justification was if nothing else, interesting. He said he wanted to see how quickly candidates could think on their feet. He felt it was study in critical thinking skills. Maybe so, maybe not but seven people that afternoon were asked that very question. None of them did well in their approach to answering it. The “right” answer would be a number. You can see why, there really is no right or wrong answer to this type of bizarre question because there’s really no way to answer it. Not directly anyway. Technically, yes, in the real world, you simply can’t. You can however, offer the panel your methodology for finding the answer, and you can bet, they’ll love your answer, even though you didn’t answer the questions. Well sir, I’d first look at the mileage distance of your county from east to west, as well as measure your squad cars in feet. I’d multiply the number of miles by 5,280, the number of feet in a mile, and once I established that figure I’d divide it by the number of feet of your average squad car. ultimately giving me the number of squads it would take to answer your question. This can be the path to an outstanding response when you have to answer trick questions. On a final note, if you’ve followed my writings or watched my videos you know that I occasionally speak on humor and its value in the oral board setting. Be careful and use it sparingly but if you’ve connected with the panel and feel comfortable, ending an answer to a questions of this nature helps relieve tension for you, and the panel, and yes, they’re often a bit on edge too. If you can offer the panel a chuckle at any time in the interview, you’ve won them over, at least at that moment, and that’s a good thing. 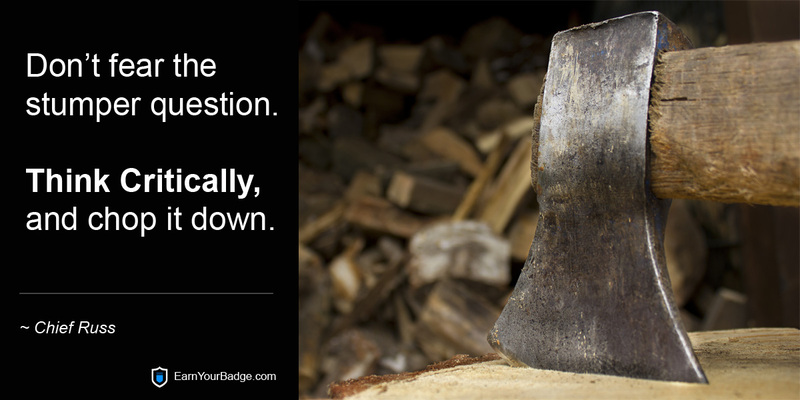 Don’t fear the stumper question, take it head on. You’ll be amazed how simple it is to give them something they’ll like, and they’ll be amazed that one of the candidates actually breezed through their peculiar question that day. It’s likely you’ll be the only one that did, and that’s a great thing!